William Fell’s son, the young William Fell, married Mary Nottingham from Bainton on 14th April 1761. He was 26 years old. She moved into the cottage and they lived with William's father, his mother having died just two months before their wedding. Berry Cottage was built by William Fell. William was a stone mason but his family also farmed in Ashton. We know this because in 1799 the Enclosures Awards Map awarded the paddock opposite the cottage to Mary Fell. Find out who she is on these pages. We are not genealogists so details in this story may be incorrect. But we're pretty certain that the main facts are accurate. Old William certainly did build the cottage and young William did inherit it from his father. But the children they had is open to interpretation. If you are an experienced genealogist and can refine my guesswork please get in touch. A good place to start is the Bishop's transcripts of the Ufford Parish registers. •	On 21st April 1762 William and Mary baptised a daughter, Elizabeth. Was she named after William's parents' first born child who had lived for only two days? That we shall never know. •	On 5th December 1763 another daughter, Mary, was baptised. •	On 19th May 1771, a daughter, Sarah, was baptised. There had been a gap of eight years and William was 34 when she was born. 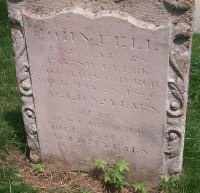 •	On 7th March 1773, another daughter, Barbara, was baptised but sadly, she seems to have lived for only fifteen months and was buried on 3rd June 1774. These girls were almost certainly born to William and Mary in the cottage but there are other children in the records who may have belonged here although there were several Fell families in the parish at the time so it's impossible to be sure. •	Jane was baptised on 1st October 1775. She seems to have died when she was seven and was buried on 7th August 1782. •	Another Barbara was baptised in September 1781 and llived until 1805 when she was buried aged 24. William would have been 44 when she was born. •	There may even have been a son, William, but he is listed as being born to "William and Mary of Ufford". 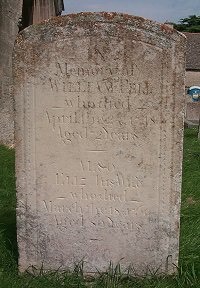 In 1780 old William, who had built the cottage, died. He was buried on 14th February alongside other members of the Fell family. We haven't been able to locate his grave but these are the gravestones of other Fells and it is certain that William's is there too. Perhaps 221 years of weather have made his engraving illegible? At that time Bainton Church, although closer, was a chapel of Ufford Church and so all major events took place in Ufford. The people of Ashton must have walked there regularly but we are not certain which way they went. When the older William died their daughters, Elizabeth and Mary, were 18 and 17 years old respectively. It's possible, of course, that they may have left home by then and perhaps gone into service, but young Sarah was only nine when her grandad died and she will undoubtedly have still been living at home. Young William was now the owner of the cottage which he lived in with his wife, Mary, and their daughter, Sarah. It's possible that he built the extension which is now our kitchen. Or perhaps he and his father had built it together? It was clearly built after the main cottage because it uses smaller and more ragged stones and this suggests that it was built by a less skilled mason than William the Elder. In 1790 Sarah, now 19 years old, married Ben Johnson. We don't know if they lived in the cottage with her parents, William and Mary Fell, but it seems likely that they did. William was now 55 years old and Mary will have been of a similar age. They will almost certainly have all farmed the family strips together. But in 1794 at the age of 59, William died and his widow, Mary Fell, inherited the cottage. She had to continue to manage the strips and it is to be hoped that Sarah and Ben did live at home to help her. Their help would be needed for another reason too, for trouble was just around the corner. In 1796, just two years after William had died, their world turned upside down when commissioners were appointed under an Act of Parliament to enclose the land. Poor Mary, without her William to help her, had to make a claim for land based on the strips she owned. And she had to bear the cost of enclosing any block of land she was awarded by planting a hawthorn hedge all round it. The story of what happened next is contained in the records of the enclosure but three years later Mary was awarded the paddock opposite the cottage and curiously, one other paddock some was away in what was the old High Field. The hedge she planted is still there. You can see it in the photograph. 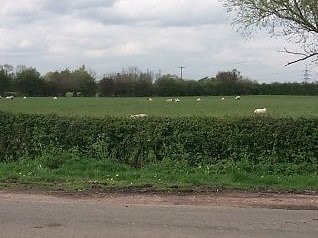 The hedge is in the foreground, recently trimmed and the sheep are in the paddock which was awarded to Mary Fell. The hedge is 269 years old now and has Elder, Ash and Willow growing in it. We watch it trimmed by tractor each year and only in our imaginations can we envisage how it was planted as young Hawthorn striplings, perhaps by Mary herself, or perhaps by Son-in-law Ben?